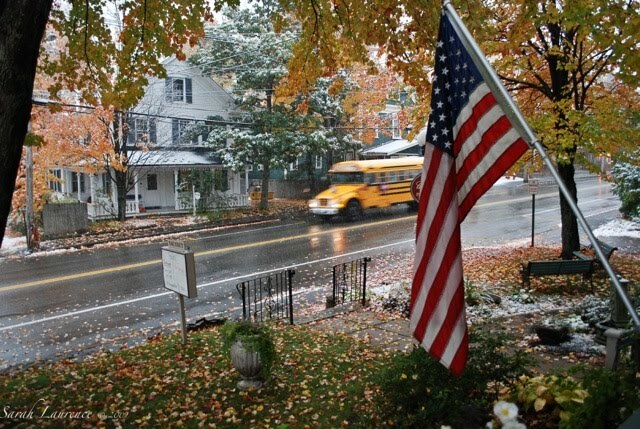 We awoke to snow falling on golden maples. Sticky flakes clung to not yet fallen leaves. The roads of Bethel shimmered like black rivers. The sky was church white. Steeples disappeared into mist, pointing at nothingness. The mountains obscured, the calendar forgotten. There is a reason they are called the White Mountains. No Snow Day for the children of Bethel. Would teacher care for a frozen apple? 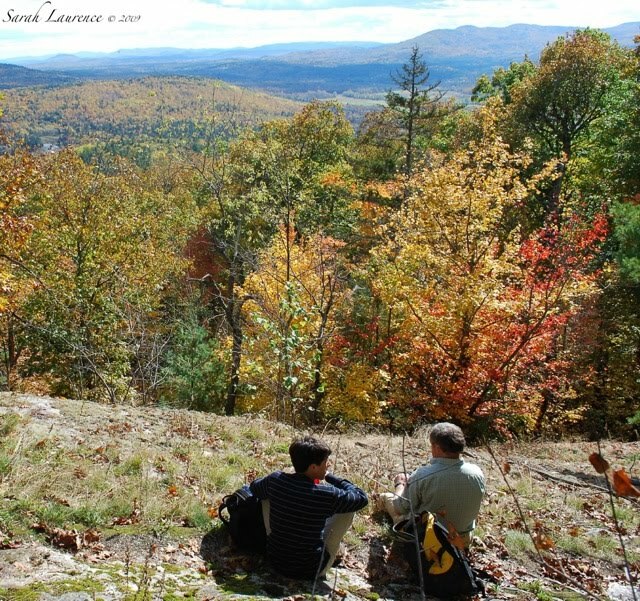 Over Columbus Day weekend, we had hiked up gilded summits. The sun was warm, the breeze gentle. A beaver pond reflected the sky, one blue square in autumn’s quilt. "Busy beavers" napped in their den. Did they know? although that season hasn’t begun. Rifle shots echoed across the valley. It must be time to hunt something. Many of the leaves hadn’t turned. Even the early red maples still showed green veins. We had been treated to a lingering summer. August had stretched into September, and September into October. Late summer and early winter: what have you done with autumn? We drove downriver to the rainy coast. Snow melted in our wake like a dream. Blog Watch: This post is part of The Fall Color Project @The Home Garden. 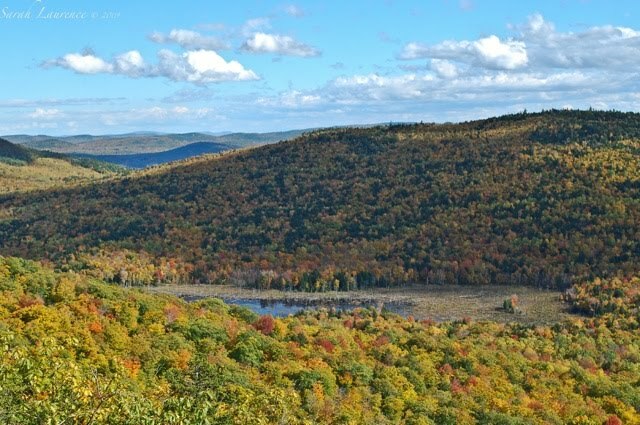 Dave will be posting links to peak fall foliage. Eternal autumn! What an exquisite post. The photographs make me sigh and your prose supports them perfectly. 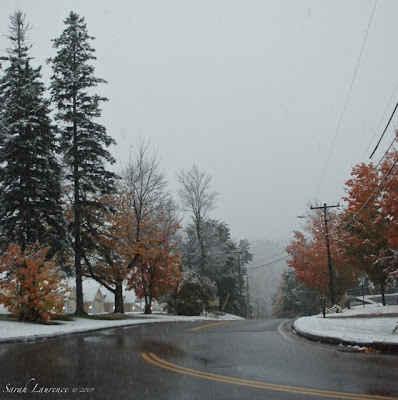 While the snow came a bit early, you captured the beauty of it on still changing leaves. What a contrast between your weekend pics and the ones today. I loved the beaver pond. Great post and fantastic images. Many thanks. What a fascinating post!! I love the first, second, and the beaver pond pictures, especially!! 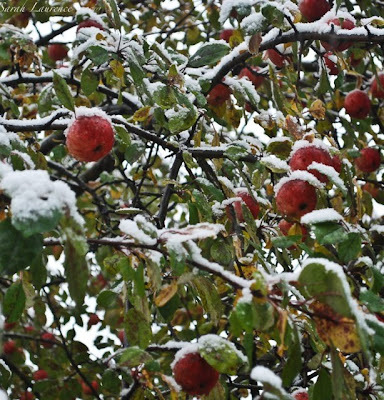 White snow is beautiful on autumn leaves and red apples!! It is still warm here. Thank you for sharing!! You have quite outdone yourself, Sarah. I loved them. 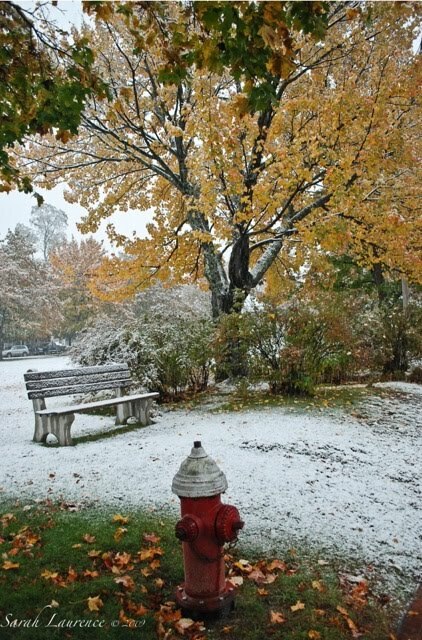 I'm not quite sure we are ready for snow this early -even if it is a visual delight. Again, totally blown away by your photos. Amazing photos; the black rivers contrasting the white skies; and earth's generous colors in the foilage represented; you've given us a connection to mother nature in all her wonder. Lovely. I especially love that shot with (I assume) your husband and son in it. The view goes on forever. We didn't get snow down here. It just rained a lot, but I did think of you up in Maine with snow. Must have been strange seeing snow so early in the season. I don't think I would like to skip over autumn so quickly, but Sarah -- those pictures!! Divine. The combination of the snow and leaden skies and vivid leaves was just breathtaking. I want to go and look at them again. What stunning photos, especially the mountain vistas. I really wanted to go to the mountains over Columbus Day weekend, but my son oddly said he would rather go somewhere on a river with a sandy beach. Not wanting to discourage any interest in the outdoors, I obliged his preference. Not much fall color when we got there, but things changed overnight. Back home we are still in the early stages. BTW, I love your larger photos! thank you for this lovely jaunt in Maine. To relish nature when she comes calling. How long will the snowing last? Gorgeous photos, Sarah! That first one should be framed! As beautiful as these scenes are, I am not ready for winter yet. I hope that autumn returns for you and you get to enjoy for a little while at least. Beautiful fall color and the snow is an added bonus. Something we down here rarely see on the maple leaves. Dave at the Home Garden is doing a peak fall round up if you are interested. I'd say this is peak fall color in Maine. Just lovely. Love the pictures!!! I used to vacation in Lake Sabego as a kid and this makes me miss it! Stunning! Every one of these pictures tells a great story. Winter doesn't know it's too early. Absolutely gorgeous photography. The colors are so amazing. So happy to see this post. Tracy, the downside of an early autumn is a long winter. I shall be envying you in the south soon enough. Bonnie, thank you! The clash of seasons made for a good subject. ACIL, it was a shock to experience that change overnight. Beavers really do sculpt their landscape. Sapphire, it has reverted to warmer weather here too. This means the leaves will last longer. Elizabeth, my first thought was: oh no, snow! My second thought was: great photo op. Thank you! MS, I do go to the mountains to reconnect with nature. It’s ironic to share it electronically. Alyson, that photo is of my husband and son. We were lucky to have 2 crystal clear hiking days. It didn’t snow beyond the mountains that day, but we got a second snowstorm by the coast last Sunday. Still, New Jersey got more snow than we did. I’ve never seen snow stick as early as Oct 13. Bee, luckily autumn came back without much leaf damage. It was truly one of the most beautiful mornings I ever experienced. I wondered if the frost would hurt the apples too. Most would have been picked by now at the farms. Les, your trip looked gorgeous too. It was my son’s idea to hit the White Mountains both years, which I happily obliged. I remember carrying him on my shoulders up mountains. We slow him down these days. I’m looking forward to watching your foliage once ours has fallen. I’m enjoying this new template with the large photo option. I won’t do it every time to avoid scroll fatigue, but it’s nice for a photo essay. Delwyn, Bethel is the ultimate New England town. On a clear day, you can see mountains encircling it. It’s a fine place to visit – about 1 ½ hours from us. My English husband thought everyone outside the US would find the beaver activity especially fascinating. I was sorry not to capture one on film. They are rarely active at midday. Anil, I love your way with words. You compliment poetry poetically. The snow only lasted a few hours before turning to rain. It was worth getting up early before breakfast to capture it. We’ll get plenty of snow that will last for months all too soon. For now I’m enjoying the golden leaves and blue skies. Rose, thank you! Henry and I were thinking of framing the first photo for our home. It’s so surreal. My thoughts exactly – winter can wait! Autumn has returned at full glorious color and warmer temps. I’m going for a bike ride soon. Tina, thanks for shout out on Dave. I participated last year and loved the peeping tour. Ryan, lucky you: Lake Sebago is beautiful and nothing beats a Maine summer. Lakeviewer, ha! I like how you see it from winter’s perspective. That could make a fun picture book for kids…. Boomer, it’s nice to see a photo of you too. Tracy, I knew what you meant. I make comment typos too. Looks like New England, all right. How I miss the Appalachians. I now live in the Cascades, and they're no less beautiful, but they're igneous and they're young--as mountains go. As I recall, the Appalachians are some of the oldest on earth, although even they are exceeded by the Ozarks. Snowbrush, welcome to my blog! The Appalachians are amazing, but I’d love to hike in the Cascades one day too. Swoon! You live in a gorgeous place, Sarah. That snow looks just lovely on the fall colours. And oh my goodness, I never thought about having to worry about a beloved pet being mistaken for a deer. Hunting season is not my favorite part of this time of year, especially with a deer colored dog. Otherwise it is paradise. Pamela, I am heading to your house next storm. Yum! Cynthia, this is good to hear. My son got impatient waiting for that photo when we were at the end of a long hike. The late afternoon light was perfect. Nice to get some feedback on my writing too - my photos usually steal the spotlight. Thank you! Very beautiful pictures. We are still wearing shorts and t-shirts in San Francisco. Can't wait to feel that first fall nip in the air. I've always loved your beautiful state as it is so much like Nova Scotia. 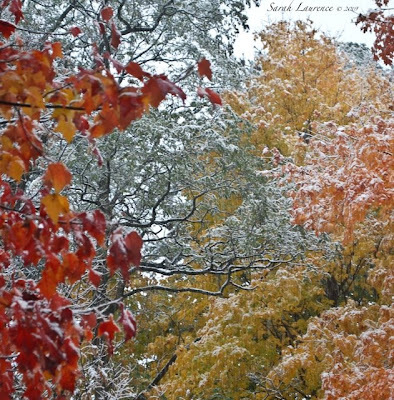 Your snowy, fall colour photos are simply gorgeous. Myredtie, welcome to my blog and thank you! I’ve already packed away my summer clothes, although it is a bit warmer than when I took these photos. San Francisco is one of my favorite cities – you are lucky to live there. I enjoyed visiting your blog too. Nancy, you are right – your part of Canada looks a lot like Maine. Beautiful shots on your blog too. Lovely mood shots, Sarah. I particularly enjoyed your narrative. It was like a walk through another place-it's been so long since I've watch the seasons change. (It does get a bit cooler in the winter here in Puerto Rico. 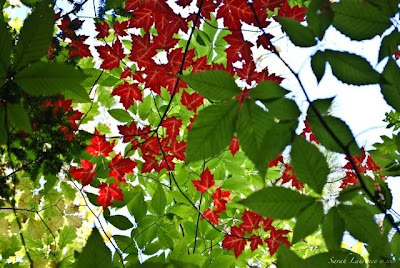 )Beautiful red-against-green maple leaf shot...just gorgeous. 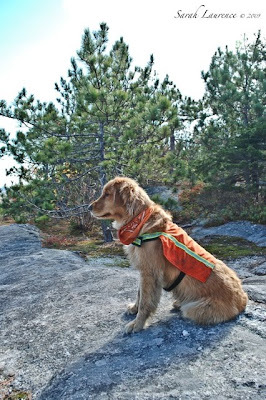 How clever to cover your dog in orange during hunting season-whichever one it is! I so appreciate your warm comments on Oasis blog, your blog-friendship means so much to me. I wish you every success. Cynthia, we weren’t so clever. I lost the bright orange bandana that Stella usually wears at this time of year, but Paws’ Inn (where Stella stayed) outfitted her in orange for our hike. The inn we stayed at last year that took us all has since shut. Thank you for your well wishes and friendship! Beautiful Ms. Sarah! Your photography is stunning. The fire hydrant in the first photo looks out of place, but in a pleasing way. Picture me as the driver of that bus in "No Snow Day for the children of Bethel," it's what I do to supplement my income as a writer. Beautiful photos Sarah, from the chilling snowy morning to breathtaking panoramic views. So pleased to have found your site. Wow, what a wonderful post for the fall color project! I enjoyed your words and photos. Each one was a delight! We are having some fall weather this week, after some early winter weather in Nebraska. I hope you are, too. TC, thank you and welcome to my blog! It was intentional - the fire hydrant makes the image even more surreal. The red is a complimentary color to green so you see the contrast all the more. It was worth wet feet to get the shot. My daughter would get a huge kick out of having a writer/driver on her bus. Our growing season is ridiculously short. I hadn’t realized Martha Stewart had a summerhouse in Maine, but that makes sense. I enjoyed your fall foliage too. Di, thank you and welcome to my blog! So nice to connect with you – your landscape is a nice contrast to mine. Sue, thanks! It’s so nice to reconnect with you. Yes, today is gorgeous here too – 60s and sunny. I just went on a hike in a T-shirt and plan on a bike ride later. Have to enjoy it while it lasts. beautiful colors! i do miss them (though i don't miss snow). Town Mouse, welcome to my blog and thank you! 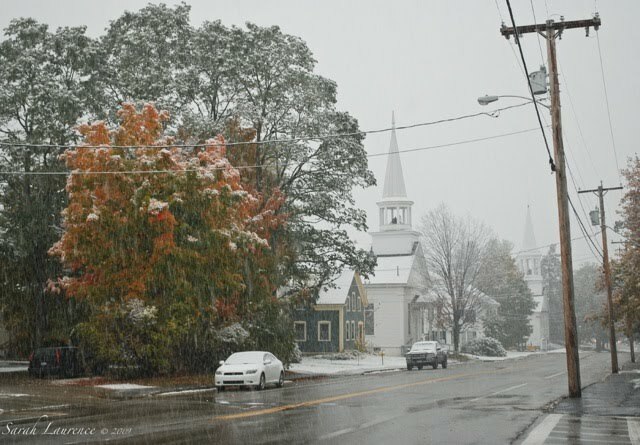 I actually like snow, but October is too early. Good for photos, though. It's been 30 years since we visited Maine and it was in the summer. Thank you for taking us back in another season. Just gorgeous, which is how I remember it, though not with snow. We were there in August. We have a white pine that towers in our yard that we dug from our friends' property on Lake Sebago (or is it Sebago Lake? I never can remember.). I carried that tree home in my suitcase! Kylee, what a souvenir! We have a mini-forest of century old White Pines in our back yard. DeLorme maps calls it Sebago Lake, but I’ve heard it called Lake Sebago too. Ryan Riley commented above about spending his vacations there as well. It does say “Vactionland” on the license plate. I enjoyed the fall foliage on your blog too. I'm finishing The Zoo Keepers Wife and hope to write a review on it soon. Wondering if you have read it? Troutbirder, we’ve strangely enough skipped back to warmer weather lately, but our leaves have not been as good as other years. I haven’t read the Zoo Keeper’s Wife. I’m looking forward to your review. Really great photos. 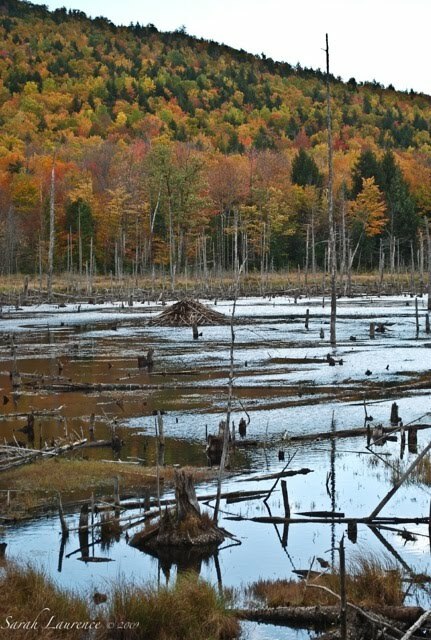 I love the one of the beaver dams. Maybe it's time to think about coming to Maine again. We could retry that trip to the ocean... at low tide? Marika, yes, come back to Maine, but maybe I shouldn’t take you on a beaver hike. We got wet, muddy feet on another mountain. The beavers had completely flooded the trail. Their dam was the only way across. The rangers should build a bridge before damage is done. Hmmm: dam…age.